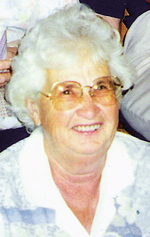 Dorothy Jean Sterkel, 81, of Loveland died on May 20, 2012 at McKee Medical Center in Loveland. She was born on November 11, 1930 in Berthoud to John and Alice (Schriner) Schleuger. She married Samuel Edward Sterkel on September 5, 1948 in Loveland. Dorothy worked as a homemaker and for many years as the Head Cook at Berthoud Elementary School. She also helped her husband Sam, work the family farm. She has lived in Loveland since 1999, moving here from Berthoud. Dorothy was a lifelong and very active member of First Congregational Church in Loveland and was very involved with the Ladies Aid. She loved cooking, especially for large groups of family and friends. She also enjoyed sewing, fishing, and spending time with her family, especially her grandchildren and great-grandchildren. If you were fortunate to have known Dorothy, you were blessed! Dorothy is survived by her husband Samuel Sterkel of Loveland, daughters, Judy Bernard and husband Mike of Loveland, Shirley Sterkel of Berthoud, Esther Balstad and husband Eric of Longmont, grandsons, Trenton and Travis Balstad of Longmont, granddaughters, Teri Farias and husband Phillip, and Jackie Brunacci and husband Jeff, all of Loveland, and great-grandchildren, Alexandra and Cameron Farias and Jordan and Jacob Brunacci. She is also survived by her sister Betty Sauer of Loveland. She is preceded in death by her sisters Eleanor Lenhardt and Lydia Tanko, and her brothers, Albert and Roland Schleuger. Funeral services will take place at 10:00 a.m, Thursday, May 24, 2012 at First Congregational Church in Loveland. Visitation will be from 3-5:00 p.m, Wednesday at Kibbey Fishburn Funeral Home in Loveland and prior to the services at the church. Interment will follow services at Berthoud Greenlawn Cemetery. Memorial contributions may be made to the First Congregational Church in care of Kibbey Fishburn Funeral Home.